Packing is a personal process. I’ve seen people arrive with nothing but baggy shorts, flip flops, a t-shirt and sunglasses. I’ve also seen travelers with two huge roller suitcases bulging with who knows what. 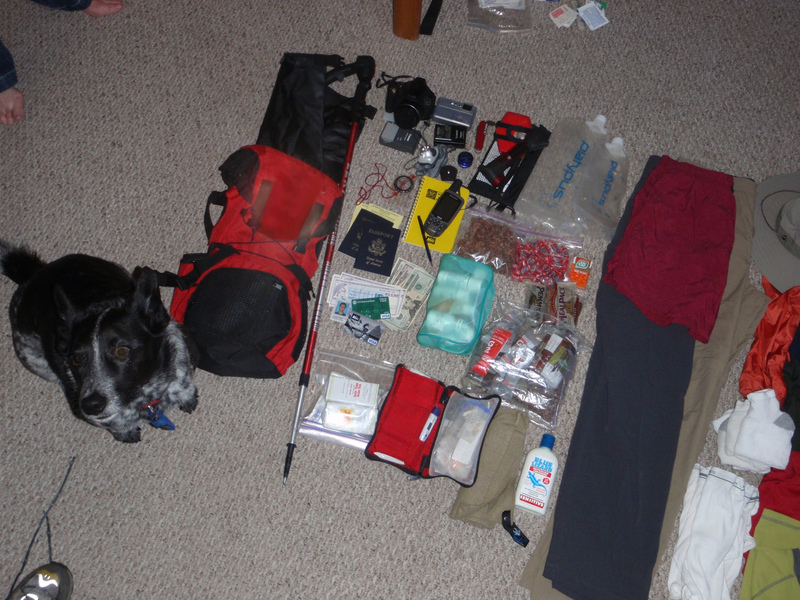 What to Take to Costa Rica? Obviously, what you take depends on how you are planning to travel, how long you stay, and your personal preferences. We’ve developed the following list over the course of more than a decade of trips to Costa Rica. It takes into account most of the situations you are likely to encounter: outdoor activities, a little nightlife, being invited into a home or to a special family occasion (more likely than you might think), and a lot of tropical relaxation. Paring the pack down for an overnight Pacuare rafting trip. Every week or so we repack everything, reorganizing for road trip mode, trek mode, or business meeting mode. 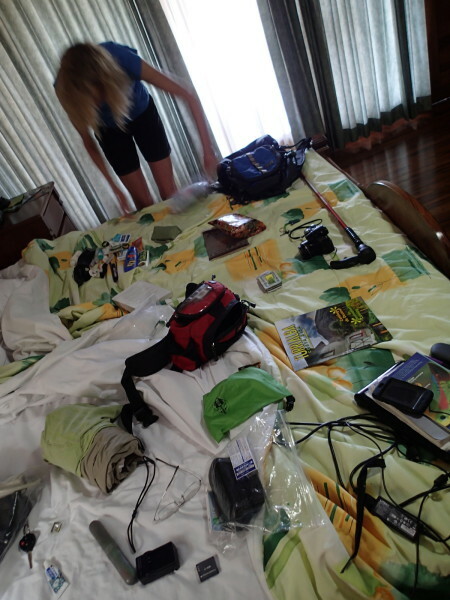 The list below includes most everything we’ve ever packed for Costa Rica with notes on why. First Aid Kit – there are a LOT of indispensable things in our first aid kit that are not on this generic list because we would never consider going anywhere without it. Headlamp or Flashlight – Power outages occur and the return path from a beachfront restaurant to your bungalow may not be obvious after sunset. We finally found a fantastic USB rechargeable Li-LED headlamp and it’s only $15 (Zure 300 lumen – pictured). Old school travelers may prefer the Black Diamond headlamp we used for years – extremely rugged, reliable and waterproof but not rechargeable (3 AAA) and costs three times as much. If you prefer a flashlight try the amazingly bright rechargeable Cygolite. Phone – a few years ago it was impossible to use a U.S. or Canadian cell phone in Costa Rica but it’s getting easier and cheaper. Buy an international plan from your carrier prior to travel (see details) to avoid extremely expensive roaming charges. Pocket Knife or Multi-Tool – don’t forget to put it in checked baggage for flights. Camera – Forget about monkey and sloth pictures with a phone. A phone is fine for beach shots but if you want real pictures you will need a real camera (see details). We’ve field tested over 20 cameras in Costa Rica and there are two very clear winners that we carry every trip. For wildlife photography the Canon Powershot SX60 pairs a crazy 65x telephoto zoom with unbelievable image stabilization. The underwater Olympus TG-5 is compact, indestructible, super fast lens for low light, also takes amazing shots on land and the LED supermacro microscope mode makes leaf cutter ants look like monsters. These two cameras cover every conceivable photo op (also see the detailed packing list for photographers). Binoculars – pack them or not? Binoculars are a tough call. They are heavy, a bit fragile and unless you spend a minimum of about $250 probably not even worth bringing because they won’t be bright enough to use in the forest. If you’re an avid birdwatcher they’re probably the first thing you pack. If you’re a casual wildlife enthusiast thinking about buying a pair just for Costa Rica you may want to skip it and spend the money on guides instead. Naturalist guides usually carry a powerful spotting scope mounted to a tripod and aim it at the animal of interest for you. We used to be avid enough to drag binoculars everywhere and found the Nikon Monarch 8×42 to be an excellent value at $250. They are obviously and remarkably better than super cheapos but our eyes aren’t good enough to see much difference between the Monarch and the $2,600.00 Swarovski. Good Budget Binoc – Celestron is the best budget brand and you’ll see them in the hands of many guides in Costa Rica. At just over a hundred bucks their waterproof, nitrogen filled, BaK-4 prism Nature DX 8×42 is a great option for casual wildlife and birdwatching. For the past couple of years our binoculars have gotten less and less use as we’ve discovered that it’s easier to see things clearly and more magnified on the digital display of our superzoom camera (see above). Umbrella – It can be a bit unwieldy when hiking but if it’s really raining hard an umbrella is the best protection and unlike a jacket or poncho you can keep your camera or binoculars dry while in use. A bit geeky but we and many professional naturalist guides we know carry umbrellas. The EEZY umbrella (pictured) at about $22 is proof you don’t have to spend a bundle to get a tough, compact, functional (it has wind dumping dual layer construction so it won’t invert) travel umbrella. Oh, and it has a lifetime warranty. We recommend the darker muted colors (gray, green) if you’re planning on wildlife watching. Resorts and eco-lodges often provide “house” umbrellas and it won’t be necessary for rain on the Pacific side during dry season but almost as important to have as a sun shade. Collapsible Trekking Pole(s)/Monopod – trekking poles are great not only to keep you from ending up face down in the muck while hiking but can be used to poke things like a log across the trail where you thought you might have seen a snake slither in… If you add a panhead mount one pole can double as a camera/video monopod to help get blur free shots in the dark understory of the forest. Water Bottle – Costa Rica is leading the way in the battle against single use plastics. Most tours and lodges have replaced their complimentary bottled water with the opportunity to purchase a logo emblazoned souvenir reusable container and fill it from their filtered water cooler. Instead, we recommend bringing one from home for several reasons 1) you’ll have it to use in the airport, on the plane etc., 2) the souvenirs look cool but are often low quality and may leach chemicals or leak in your backpack, 3) you can always buy a souvenir sticker and add it to your bottle – we recommend insulated stainless steel like the HydroFlask.Alternatively if you’re doing a lot of hiking and trekking then a lightweight collapsible option like the Platypus bags is much more practical than an insulated stainless steel bottle. We usually carry a 1 L small mouth and refill from streams and springs along the trail using our MRS filtration system. Straws – another front in the battle against single use plastic is the elimination of plastic drinking straws. Perhaps the ultimate hipster bar hopping accessory is a metal sleeved, silicone capped, stainless steel drinking straw with integrated cleaning brush. We’ve never bothered because straws just aren’t that important to us and it’s fun to experience all the alternatives popping up – good old fashioned paper, bamboo shoots, and avocado pit biodegradable polymer are just a few. If you’re planning on viewing wildlife in Costa Rica choose your wardrobe accordingly. Birds and animals definitely notice bright colors and may take off. There’s no need to go full camo but if you have a choice between fluorescent pink or muted tan or green pick the more neutral color. It can be surprisingly chilly. Popular destinations like Poás and Irazú volcanoes, Monteverde cloud forest, and Chirripó peak are at high elevations – sweater and jacket weather most of the time. You may also be surprised to find that neither your hotel room nor (older) rental cars have a heat setting on the thermostat. Water is another consideration when planning your wardrobe. Cloud and rain forests have little regard for phrases like “the dry season.” It may not rain during your visit, but the saturating humidity dripping from the leaves and the spray from the inevitable waterfall will make you glad for quick-drying garments. Washing clothes as you go is a great way to keep your bag light but laundromats are few and far between in Costa Rica. Laundry services are fairly common in tourist areas (they wash, dry and fold for about $10-$15 a load). Hotels often have laundry services—expect to pay a buck or two per item. Hand washing isn’t too onerous if you only have a few items (things like jeans can take forever to dry). 3-5 T-shirts – The biggest variable when choosing T-shirts is natural fiber vs. plastic. We recommend natural fibers like cotton, hemp, wool, or bamboo – if you haven’t tried bamboo fiber clothes consider it – soft, breathable, odor resistant. 1-2 Long Sleeved Shirts – for mosquito protection, bushwhacking and to cover your sunburn if you don’t use enough sunscreen the first day. I have a Columbia shirt like the one pictured and I like it because it’s got tabs to hold the sleeves up and it’s classy enough to wear to a casual business meeting (we have to work in Costa Rica sometimes). 1-2 Dressy Shirts or Blouses – if you’d like to clean up a bit for dinner or drinks and dancing. 2-3 Pairs Shorts – one or two pairs of quick drying nylon and one or two pairs of dressy cotton shorts or tropical weight/length skirts. 1-2 Pairs Long Pants – Something dressy and something for the bush. They’re a bit nerdy but convertible pants (zip-off legs) are super practical for travel – long pants and shorts in one. Travelers are often surprised that we recommend long pants for the tropics but rain forest plants and insects have chemical and physical defense mechanisms that you don’t want to experience first-hand. Long pants help protect your legs from scrapes, scratches, injections, and insect invasions in the lowland jungles and from the cold at chilly high elevations on the volcanoes or in the cloud forest. Underwear – obviously a personal preference item so we won’t “go there” and tell you what to wear in Costa Rica. However, I will warn you that I field tested the “round the world” travel boxer brief from ExOffico and was not at all impressed. The material was shiny and clingy and felt a bit like wearing a plastic bag with holes punched in it. They also started pilling after about 20 miles of trekking. Not recommended. I tossed them out and went back to the old reliable options – Hanes cotton boxers, lined running/sport shorts and commando. We didn’t field test the bikini version but the material seemed to be about the same. 2-10 Pairs Socks – type and count varies a lot. We often wear sports sandals or flip flops without socks. If you’re going to wear closed shoes most of the time you’ll want extra socks because they’ll get wet and stinky fast either because of tropical perspiration or precipitation. Jacket – It is the tropics, but you will need something to keep you warm at higher elevations, or on the open ocean. It gets genuinely cold in the cloud forest and on volcano rims. We recommend a lightweight pile jacket, and a water and wind resistant jacket that can be folded into its own pocket. The important criteria isn’t so much the weight as the packed size. If it’s small enough to cram in your fanny pack or pocket, you’re much more likely to have it when you need it. Poncho – Personally we’re not poncho fans but many people swear by them. The biggest issue is getting stuff that’s under the poncho (camera, binoculars, bandana, water bottle) out from under the poncho when you need it. Safari Hat, Baseball Cap or Brimmed Hat – to keep the sun off. If you choose the baseball cap, bring a bandana to hang out the back and protect your neck. Mesh Bag for Wet Clothes – Some people suggest a plastic bag or dry bag, but if you go the waterproof route don’t leave the clothes in the bag more than a couple of hours or you might as well just throw them away. If you forget they’ll putrefy. Oh yeah, don’t forget your Swimsuit – active/sports swimsuit and a tanning suit (guys you may not know what we mean, so just bring your suit). You may also want a sarong or other casual beach cover-up. Shoes are a difficult decision. Gear heads would want several pairs to match the wide variety of terrain and conditions in Costa Rica. Good choices include amphibian hikers, nylon/gortex® boots, army surplus jungle boots, high top tennis shoes, or just your most comfortable walking shoes. For heavy slogging it’s possible to borrow or rent the rubber muck boots that the locals favor. However, don’t expect to find anything larger than men’s size 11 (size 45 European). I love my Vasque Skywalks, but leather mountaineering boots are typically designed for boulder fields and glissading and are not ideal for rainforest conditions. They weigh a ton, can cause blisters when they are wet, and in Costa Rica they will never dry out. Not recommended. When traveling ultra-light (unsupported bicycle touring), we’ve always worn Alp sandals as our only pair of shoes. This company started in a garage in California with an exceptional design, was bought out by Teva, who produced a similar design for a while before Rafters brand came out with a near perfect knockoff and finally Keen copied the pattern and added a toe guard. The Keen evolution of the original Alp is the best sport sandal we know of. One pair is a compromise and sometimes we didn’t have the ideal traction, support or protection, but the light weight, ultimate breathability, rapid drying, ease of washing, and comfort more than made up for the negatives. Amphibian hikers/Water Shoes – advantages include lightweight, fast drying and reasonably good traction. The main disadvantage is they never quite seem to fit quite right. We’ve tried Keen, Merrell, Solomon, and others and they all rub and blister some. Hiking/Walking Shoes – these could include lightweight hiking boots like Merrell or just sneakers or trail runners with good traction. Beach Sandals/Flip-Flops – a note on flip flops – many organized tours like rafting, rappelling, ziplines, and canyoning require closed toe shoes. Crocs – the most talented canyoneering guide and waterfall climber we know does it all in Crocs. Can’t say they work for me but obviously ideal for some people. We saw the hamburger that Mike mentions when the only Tico member of our expedition across the Talamancas insisted that he was going to wear mountaineering boots. His feet ended up so mangled he had to be carried by the Gringos in their water shoes and indigenous guides in Crocs and Flip Flops (seriously, one guide completed a transcontinental trek in flip flops!). While our critics are correct in assuming that the sandals and water shoes won’t provide any protection from snake bite they’re mistaken in thinking that most hiking boots will be better. You might as well be wearing slippers when it comes to terciopelo fangs. Scientists and others who spend time in areas where snakes are common know this and use what are called snake gaiters (see image). They’re light-weight kevlar and cordura armor that covers the top of the foot and the calf nearly up to the knee. They are expensive and a bit clumsy but they work. The second best option are the rubber muck boots worn by farm workers and ranchers. They won’t stop the fangs from penetrating but unless you have huge calves they are usually floppy enough that they may keep the fangs from reaching your leg. Not great, but maybe better than nothing. The best defense against snakebite regardless of the sort of armor you’re wearing is to look carefully where you are placing your feet and hands. If you don’t step on them or grab them most Costa Rican snakes are very unlikely to bite. All of these items are readily available (except tampons in more remote areas) in the local Supermercado or Farmacía, but unless you’re on an extended trip bring them from home and spend your time on the beach rather than in checkout lines. First Aid Kit – yes we know we are repeating ourselves – it’s worth repeating. As an absolute minimum you’ll want headache remedy of choice, Imodium, tweezers, antihistamine but we recommend and always carry the full kit. Aloe Vera – in case you don’t use enough sunscreen – it really helps sunburns. Get 100% gel without any additives or fragrance. Mosquito Repellent – DEET is our go to but in the past few years a couple of more natural alternatives that actually work have come on the market (see details). Razor – and spare blades. Towel – if you’re staying anywhere that charges less than $US 30 per night, they may not be provided. Even if your hotels provide towels, they may not appreciate you “borrowing” them for your hike to the rain forest waterfall or hot spring. Synthetic backpacking towels are small, lightweight, wringable, and quick drying- great for everything except modesty (too small to cover much). Cosmetics – unless you like sporting a Goth racoon look consider bringing waterproof mascara etc. Prescriptions – should be filled before you leave home. Although it is probably possible to get any medication you might need, it’s not worth wasting the time it might take. Sunglasses – don’t mess around with your eyes. Get 100% UV blocking and when choosing a shape, remember that water and sand can reflect dangerous rays around the bottom and sides of the glasses. Tampons – hard to find in rural areas, and expensive when you do find them. If you use them bring them. Contact Lenses and Cleaning Solutions – available in Costa Rica but it may be hard to find specific brands and they’re relatively expensive. If you rely on them, bring enough for your whole trip and a pair of glasses just in case. If you’re traveling with more than one person you should spread your important documents out so if something happens to some of them you’ll have a back up. For example I carry both passports and Sue carries both driver’s licenses. That way we at least have ID if one of us loses our wallet. There’s a detailed discussion of Passports and Documents here if you want more info. Passport – it was once possible (although ill advised) to travel from the United States to Costa Rica with only a drivers license for documentation. Now a passport is required. Your passport will also be required to board a plane, for bank transactions, checking into hotels, car rentals and of course to return home. Drivers License – required to rent a car or drive and a good backup ID. Keep it separate from your passport. U.S. Canadian and European licenses are all valid. Money – pros and cons of each method of getting, carrying and spending your money – make sure you’ve got at least a couple of days worth of cash and a credit/debit/bank card as backup. Money Belt or Passport Pendant – somewhere to carry your documents. Your Login Information – if you have devices that log you in automatically at home and work you may not know your passwords. You will need them if you’re using a hotel computer. You won’t be able to use “forgot password” if you can’t access your e-mail. Both Authentication Factors – If you have logins with two factor authentication (aka two step verification) be sure you have your other factor(s) available. For example gmail will detect that your account is being accessed from a foreign country and almost certainly require you to further identify yourself; usually by texting a code number to your phone. If you didn’t bring your phone you won’t be able to access your e-mail. Insurance Information – medical care in Costa Rica is nationalized and it is unlikely that your health insurance will be accepted however some providers may pay for medically necessary evacuation. Besides some light reading and a recommended guidebook you may also want to pick these up. Waterproof Travel Map of Costa Rica – It’s nice to have an overview of where you’re going and an accurate backup for WAZE or GPS navigation. Spanish/English Phrase Book – The Lonely Planet pocket phrase book is specific to Costa Rican Spanish. A Guide to the Birds of Costa Rica by Gary Stiles and Alexander Skutch, Illustrated by Dana Gardner is the bird watching gold standard but we prefer the smaller lighter and easier to use Zona Tropical publication The Birds of Costa Rica: A Field Guide by Richard Garrigues and Illustrated by Robert Dean. Serious naturalists might want Janzen’s “Costa Rican Natural History” This would also be a great gift for an exceptional guide; it’s considered the bible of Costa Rican Ecology. Costa Rica Wildlife Guide is a 12 panel laminated quick reference card with hundreds of common species. Kids love them. Plastic Bags – plastic may be the worst enemy of our environment, but it might be the travelers best friend. Reuse, recycle and dispose properly but take advantage of this miracle of modern science. A Photo of Your Home or Family – can jump start a conversation. Family is very important to Ticos. Don’t forget your Address Book so you can make everyone at home jealous with retro snail mail post cards. Clothesline – hang muddy pants on the terrace or for a quick hand wash in the sink (see tips for doing laundry while traveling). Lightweight pile blankets are common in small shops and even supermarkets and we usually just buy one (under $10) instead of packing it. Insulated Beverage Container – to go cups are becoming more common but still hard to find outside fast food and chain coffee outlets. A travel mug is much more environmental anyway. Croakies® or other glasses retainer system for your prescription or sunglasses. Zipties – useful for repairs and to “lock” your backpack. Obviously anyone with a knife can cut the tie, but it will reduce opportunistic pilfering. Anyone with a knife can also slit the pack open. Gifts – small tokens of your appreciation, or something to keep a small child entertained so you don’t have to listen to them cry on a 200 km bus ride. Battery Power Bank – most people think of these as a backup for their cell phone but we use it for all of our gizmos – most digital cameras allow in camera charging so plug into the power bank for a couple of minutes and get that sunset photo you would have missed otherwise – head lamps, i-pad/tablet, kindle readers, portable GPS, and of course phones all get a quick boost anywhere. Cygolite – Amazing for night hikes; our naturalist guides always beg us to sell ours after they see them in action. Actually it’s a bicycle light but they slip easily off the mounting bracket and are incredibly bright (think car headlight), waterproof, rugged, and run about 4 hours continuously on a single charge of the lithium polymer batteries. Kindle – we are avid readers and firmly believe the Kindle paperwhite e-ink is the best innovation for travel in the last 10 years (cell phones and digital cameras are pretty good too but they’re older)! Download a good guidebook and something to read while swinging in a hammock on the beach, when the ferry is a couple of hours late, or you miss your bus and have to wait for the next one. Victorinox Nail Clipper – a nail clipper sounds frivolous but can prevent a lot of bloodshed. Untrimmed toenails will cut into the adjacent toes on a long hike. Handy if you forget to do it before you leave or stay for a couple of weeks and they grow. The knife blade is sharp as a razor and the scissors are indispensable for cutting mole foam and surgical tape to cover the cut if you forget to clip. RavPower UltraViolet pb28 – This tiny little gizmo is a combination 3200 mAh portable charger and UV flashlight. We bought it because scorpions light up like neon signs when you point it at them and UV light reveals all sorts of patterns on bugs, plants and other interesting creatures. It attracts moths and butterflies when pointed at a light colored surface at night (called a light trap), and can be used to check to see if the sheets are really clean in a hotel room. It’s also handy because you can run the rechargeable lithium polymer battery backwards to get about a 50% charge on an iphone. Power Strip Protected Plus – Phone, kindle, i-pad, led flashlight, digital camera, portable power bank – the long list of things we need to recharge when we check into a new lodge. There never seem to be enough outlets and the power coming straight out of the wall in Costa Rica can be extremely “dirty” with surges and spikes that can damage sensitive electronics. The rotating travel outlet strip is compact, grounded, surge protected (for your laptop or other 110v a/c plugins), plus it has two built in USB ports that allow you leave a whole armload of device specific power supplies and battery chargers at home. The evolution to a complete power solution is obvious to us although no manufacturer has figured it out yet – pack a couple of Li-polymer cells inside adding unplugged portable power bank recharging for phones and devices. For now you’ll just have to buy a separate battery pack. Power Pirate – Need a third USB charger for the travel Power Strip? The Power Pirate gives you one without sacrificing an outlet. Hold the Pirate against the outlet then plug a two prong power cord through it. If you use it on one of the outlets on the strip it will be surge protected too. Green Laser Pointer – Surprisingly helpful to show others where the tent making bat is hanging 40 feet up in the forest canopy. Don’t point it in the animal’s eyes. Point it at a leaf of trunk a few feet away and tell the kids to look “just above the green dot.” Human eyes are most sensitive to the green part of the spectrum so a green laser works best but they are getting hard to buy because people are pointing them at airplanes and interfering with pilots vision. Red works okay too. LED Anywhere Light – At about the size of a fat ball point pen and as cheap as a couple of bucks a flexible dimmable USB powered LED lamp is one of the most useful and versatile travel gadgets you can have. It’s bright enough to plug directly into your outlet strip and light a small room, can be dialed down to personal reading lamp intensity, plugged into a laptop as a keyboard light, or used with a Li-polymer power pack as a super bright flashlight for the path back to your beach bungalow after dinner. We’ve used suitcases, soft duffels, rolling duffels, carry-ons, backpacks and even just plain old cardboard boxes as luggage. There’s no real ideal choice for Costa Rica. While a small rolling suitcase is great for the airport, paved areas around lodges or inside the hotel the people wearing backpacks will fare much better when they encounter gravel driveways and paths or uneven vertical curb concrete amalgams that pass as sidewalks in Costa Rica. The best advice we can offer is instead of worrying about choosing the ideal bag try to keep whatever you carry to a minimum. You’ll be much happier carrying 20 lbs than dragging around 50lbs no matter how it’s packaged. When we don’t have to travel with giant cases (stuff for work or U.S. shopping being delivered to expats) we use carry-on sized backpacks lined with a dry bag that double as bike panniers and keep our weight total under 25lbs.